Information: Paola, or, as it is popularly known, "Rahal Gdid" (the new village), became a parish in 1910, and the parish church was the church of St. Ubaldesca, which the Government gave to the Church so that it could serve as a parish church; but this church was too small for the population of the locality and so the present church dedicated to Christ the King was built. Other information on churches under this parish: Chapel of the Sisters of St. Joseph of the Apparition The Sisters of St. Joseph of the Apparition settled in Paola in 1910 and opened a school which, in 1926, was transferred to n. 69 Zabbar Road: the chapel is open to the people residing in the vicinity Priest in charge Parish Priest Holy Masses Sundays and Feast Days: 8.15 am (winter); 7.45 am (summer) Weekdays: 8.30 am Saturdays: 8.00 am Church of St. Anthony at Ghajn Dwieli In 1953 tha Capuchin friars opened a small chapel at Ghajn Dwieli, but they soon realised the need of building a large church, which eventually was opened for worship in 1965. The church is dedicated to St. Anthony of Padua, and marriages may be celebrated there. Priest in charge Rev William Axiaq OFM Cap Telephone 21828157 - 21663130 Holy Masses Sundays and Feast Days: 6.00, 7.00, 8.00, 9.00 and 12.00 Saturday Evenings: 6.00 pm (winter) ; 6.30 pm (summer) Weekdays: 6.00, 6.45, 8.00, 6.00 pm (winter); 6.30 pm (summer) Church of St. Ubaldesca The church was built in 1629 by Grandmaster De Paule. 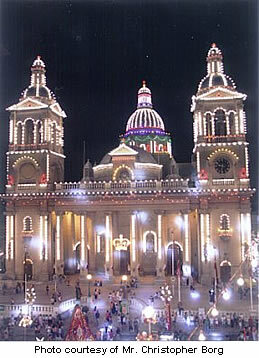 When the Order of St. John left Malta, the church became Government property, but, requested by the bishop, the Government gave the church to the ecclesiastical authorities to serve as a parish church; it served as a subsidiary parish church from 1905 to 1910 when Paola became a parish of its own right. The church ceased to be the parish church of the locality when the church of Christ the King was built.